Preheat the oven to 425°. On a large sheet of foil, toss the beets with 1 tablespoon of the oil; season with salt and wrap up in the foil. Roast for about 45 minutes, until tender. Unwrap and let the beets cool, then peel. Cut into wedges and place in a bowl. Add the vinegar, season with salt and toss. Meanwhile, in a medium saucepan, cover the quinoa with 2 cups of water; bring to a boil. Cover and cook over moderately low heat for about 15 minutes, until all the water is absorbed. Fluff the quinoa and transfer to a bowl to cool slightly. Add the lemon zest and 2 tablespoons each of the lemon juice and oil; season with salt and pepper. In a bowl, using a fork, smash the berries with 3 tablespoons of the olive oil until a chunky sauce forms. Season with salt. In a small bowl, mash the avocado with the remaining 1 tablespoon each of olive oil and lemon juice; season with salt and pepper. Spoon the quinoa into bowls. Arrange the beets on top and spoon the berry sauce over the beets. Dollop with the avocado, garnish with pistachios and serve. 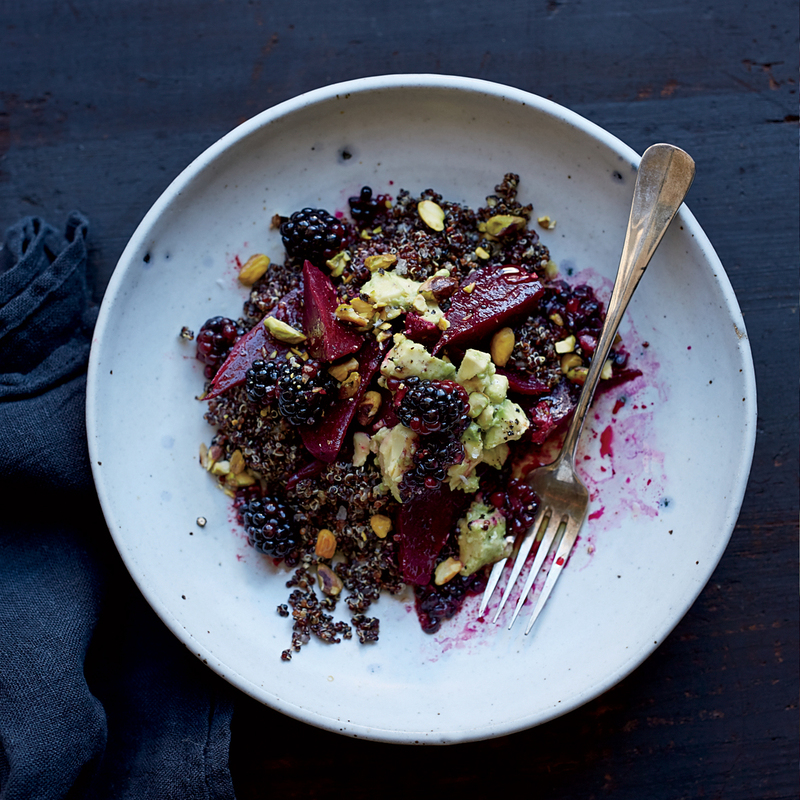 The cooked beets and quinoa can be refrigerated separately for 2 days. Review Body: This is delicious! I had beets and blackberries in my fridge and instinctively thought they'd go well together, but didn't really know what to make. I had most of the ingredients needed for this recipe and gave it a try. So good! I didn't have pistachios and didn't want to go to the store, so I skipped them. I also had store-bought guacamole and topped my Beets and Berries with that.